Vincent van Gogh. What does this name mean to you – sunflowers, Starry Night, the painter who cut off his ear or the man who committed suicide? The Van Gogh Museum is one of the most popular museums in Amsterdam. It is home to the art collection of Theo van Gogh, Vincent’s younger brother, and displays paintings and drawings by Vincent and selected works of contemporaries such as Toulouse-Lautrec, Gauguin, Monet and others. The Van Gogh Museum in Amsterdam showcases van Gogh’s most important works and tells the stories behind these works of art. Ten to one that you have seen a Van Gogh painting, but probably not a real one; calendars, mugs, T-shirts, posters, mousepads, wall clocks, stickers all have Vincent’s paintings. Google Van Gogh reproduction and 8.710.000 hits show his popularity. It is difficult to believe that his contemporaries did not recognize his genius. Art critics considered his use of colour unrealistic and also commented on the anatomical anomalies in his paintings. The painter did not strive for photographic realism but wanted to capture mood and emotion. Vincent painted sunflowers from ochre yellow to arid brown, in full bloom and wilting to die. Starry Night – a velvet blue sky with stars that dance and twirl like ballerinas resides in the Museum of Modern Art in New York. 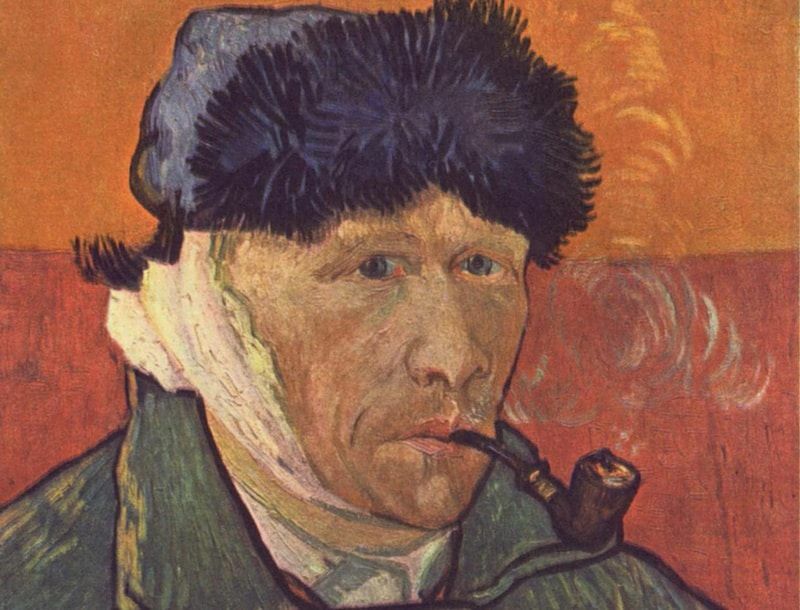 After Vincent cut off the lobe of his left ear, he wrapped it in a cloth and gave it to a prostitute to guard this object carefully. After this self-inflicted wound he fell into a depression. He had a breakdown and admitted himself to Saint-Paul-de-Mausole lunatic asylum. 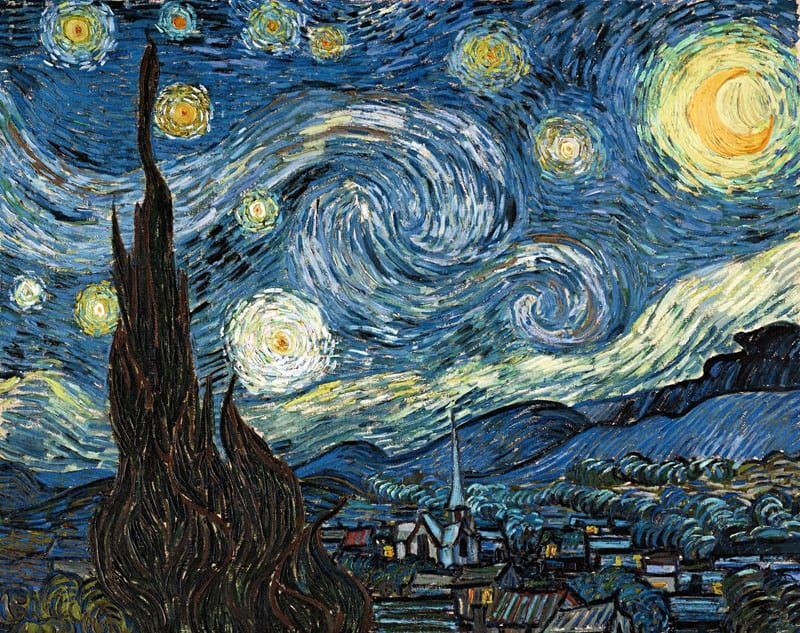 Starry Night was painted during the day from his bedroom window in the asylum. He painted the view from his bedroom window at different times of the day and under various weather conditions. Starry Night is the only painting depicting night. Vincent sold only one painting during his lifetime, the Red Vineyard. This picture is now in Pushkin Museum, in Moscow. He lived from allowances he received from his brother Theo, who was an art dealer. Vincent shot himself in the chest on 27 July 1890. He lived for another two days. When asked why he had injured himself, Vincent said, ‘I’m free to do what I like with my own life’. This Museum is Amsterdam’s most popular museum. The collection comprises 200 paintings, 500 drawings and almost all van Gogh’s letters. It is home to the art collection of Theo van Gogh, Vincent’s younger brother and art collector. The paintings are exhibited in chronological order. The ground floor of the museum provides an introduction to his life (1854-1890). The star painting of this period is the Potato Eaters – five members of a peasant family sit around a table, eating potatoes. Studies of peasants show how this painting came about. The drab grey and earthy brown paintings of Van Gogh’s early period are in stark contrast to the vermillion, emerald green and Prussian blue of his later works, displayed on the second floor. Vincent lived in Arles, France, for the last two years of his life. During these two years, he painted two hundred works ranging from various versions of sunflowers to bright sunlight of the Provence. The Van Gogh Museum is located in the Museum Quarter of Amsterdam, close to the Modern Art Museum and the Rijksmuseum. The museum is accessible by tram 2 or 12. Underneath Museumplein is Q-Park, parking garage. Parking in the streets is quite expensive. You will be using the digital parking system.